The voice of Michelle Nguyen was Kate Jones. The voice of Steve Carlsberg was Hal Lublin. The voice of Tamika Flynn was Symphony Sanders. The voice of Deb was Meg Bashwinner. The voice of Mayor Cardinal was Jasika Nicole. The voices of the automatic phone service were Erica Livingston and Christopher Loar. My son’s name is Roger. I finally asked him, and he told me. It was that easy, and it wasn’t easy at all. The message from Fey breaks my heart all over again. I always love it when they try a unique format for an episode. I . . . there's so much to unpack here. I loved all the voice work, especially Carlos and Steve Carlsberg. Can we talk about Steve Carlsberg for a minute? Like, the T-shirt thing. Are we to assume that these are the same T-shirts that are available for sale in the Night Vale store? Or am I the only one who went there? More and more I feel like Steve is an outsider and a conspiracy nut who sought out Night Vale due to his interest in Vague, Yet Menacing Government Agencies. And he apparently makes merchandise to sell on Topatoco. The weather also made me think a bunch. I know they choose the weather far in advance and not necessarily according to the show's plot, but the weather really, really, made me think. But really. What has Kevin been working on? Really. "This is Ma--DANA Cardinal." Hmmm, what's that about? Also, FOW wants to destroy Cecil. Eeek. "Frank Chin. Normal human with one voice. Normal human with normal head amount." Uh-HUH. Watch out for Dog Park Poetry Week. THIS WHOLE DESERT IS THE DOG PARK. You can totally visit, if you just walk a few hundred miles into the dog park.... which makes me wonder if that's what Cecil is up to and why the voice mail is full. I assumed she was about to say "Mayor Cardinal", and then decided that it wouldn't be the best way to start the conversation if she wanted to talk to Cecil as a friend. So yeah, the dog park. 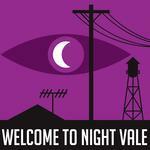 Literally the first thing we ever learned about Night Vale is not to go into the dog park. DO NOT ENTER THE DOG PARK. Now we find out (or really, have confirmation of Dana's experiences) that the inside is this vast desert wasteland and, you know? This sounds bad. We're not even supposed to be thinking too much about the dog park - didn't Cecil once mention that this was a thought crime? The Faceless Old Woman was so MEAN!!!!!! All that, "I have a great memory, unlike YOU." Way to twist the knife! It's already been established that there's great cell phone reception in the desert otherworld, and cell batteries seem to last forever there, so Cecil being there wouldn't explain his full voice mail. Hey, sorry to call again so soon…I know we talked about space and boundaries and all of that, especially with this whole Lot 37 thing you’re going through…gotta have time to think. What the hell is that about????? Lot 37 was the auction of one Cecil Gershwin Palmer. Yah, I know, the part I found weird was Cecil apparently having to talk to Carlos about giving him space. Not too much more space to be given when you're in a desert otherworld! Frank Chen's normal human voicemail made me laugh out loud while walking through a stuffy old subdivision. I love Jackson Publick's voice. Dylan Marron sounded wrong to me at first -- I thought they should have picked an actor with a smoky voice -- but he has really grown on me. He's totally lovable and totally out of his mind if he thinks this is a good idea. Steve Carlsberg never gets old. I hope Hal Lublin does impressions again in the live show. I'm so excited to get to see these guys on tour, although I am alarmed to see that Fink and Cranor both had to tweet today to remind people that it is NOT OKAY TO SNEAK BACKSTAGE. Kids.